“Welcome, Dodger fans! Bring money.” A man leaves the Dodger Stadium gift shop, June 20, 2011. Photo by Reed Saxon/Associated Press. But it was not always this way. The O’Malleys’ low ticket price strategy was part of a larger business plan, centered on getting as many repeat customers into their ballpark as possible. Like Disneyland, the theme park showplace that Dodgers executives visited and studied, Dodger Stadium would feature affordable prices that would attract families, and especially women and children. 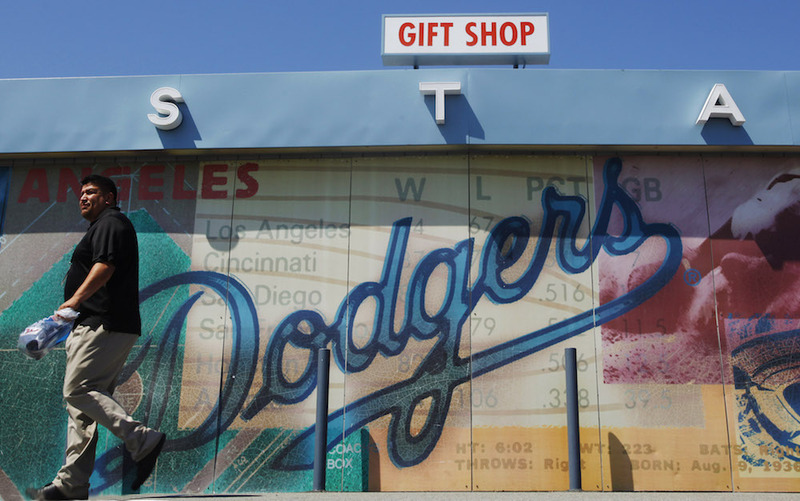 Once they were through the turnstiles and “in the building,” these families would spend money on concessions—lots and lots of Dodger Dogs—as well as all manner of Dodger logo branded souvenirs to be worn, waved, and displayed. Most important of all was the atmosphere inside the stadium. Beautiful views of downtown and the mountains. Organ music. Friendly and efficient park employees. Cleanliness. Safety. Fan greetings on the scoreboards. Promotions. Autograph and picture days. Not to mention Sandy Koufax, Don Drysdale, Maury Wills, Steve Garvey, Fernando Valenzuela, Orel Hershiser, and eight National League pennants in the stadium’s first quarter century of operation. This business model also served to make the stadium one of Los Angeles’ most inclusive and diverse public venues, since its affordable ticket prices drew fans from across racial, ethnic, and class lines. Club box and dugout level seating, which were class-exclusionary, represented only 3 to 4 percent of available ticketing options at Dodger Stadium in the 1960s. So if any institution in Los Angeles could be termed “democratic,” in the sense of offering the greatest good for the greatest number, it was Dodger Stadium during that time. No one would call Dodger Stadium democratic today. It is not designed for repeat visitors, unless they are hedge fund managers or employees fortunate enough to get their hands on the company season tickets. The team, owned by Guggenheim, a financial services consortium, has gone upscale. It has spent more on players and stadium renovations, while also charging fans much more for tickets and parking. If you’re planning to come as a family, make sure your monthly rent or mortgage payment is covered first. Even a family of four that bought the cheapest tickets in the ballpark, along with four hot dogs and four drinks, would spend $134. The same family would spend approximately $120 for the same combination at a movie theater, where parking is often free. In a 21st-century Los Angeles rife with income stagnation, racial separation, and social alienation, we need Dodger Stadium to return to its roots. The emphasis, as it was when the O’Malleys owned the team, needs to be on families and on children. Let kids under 14 in for half price. And give families a special discount. The money lost on the front end would be a fraction of what lifelong Dodger fans would spend over the years at their favorite stadium. A democratized Dodger Stadium would not solve all of the city’s problems, but every small, good thing counts in a time like this. Jerald Podair is a professor of history at Lawrence University and author of the recently published, City of Dreams: Dodger Stadium and the Birth of Modern Los Angeles (Princeton University Press).